After prying everything off the old bathroom floor……3 layers of vinyl flooring, a layer of tar paper and one more layer of hardie-board…..
We are left with this loveliness…. 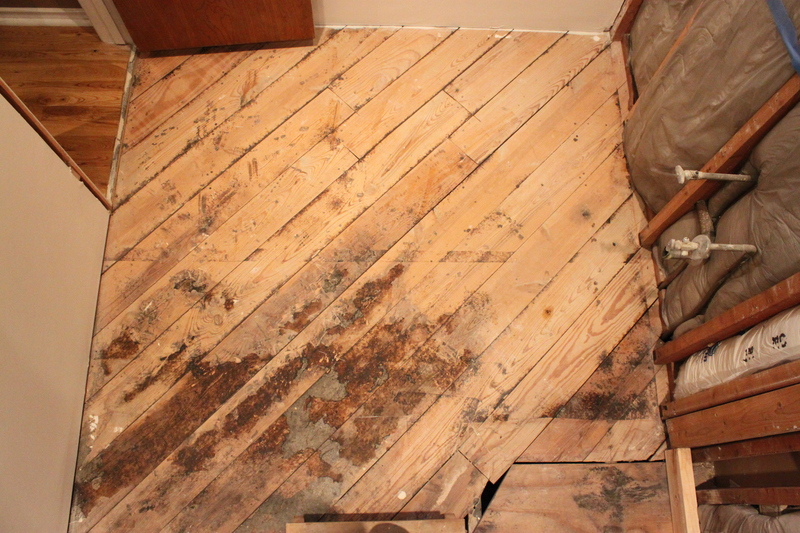 If this were “Rehab Addict”, Nicole Curtis would simple stain this diagonal floor and call it a day…but, Ummm…we have slightly higher standards than that. 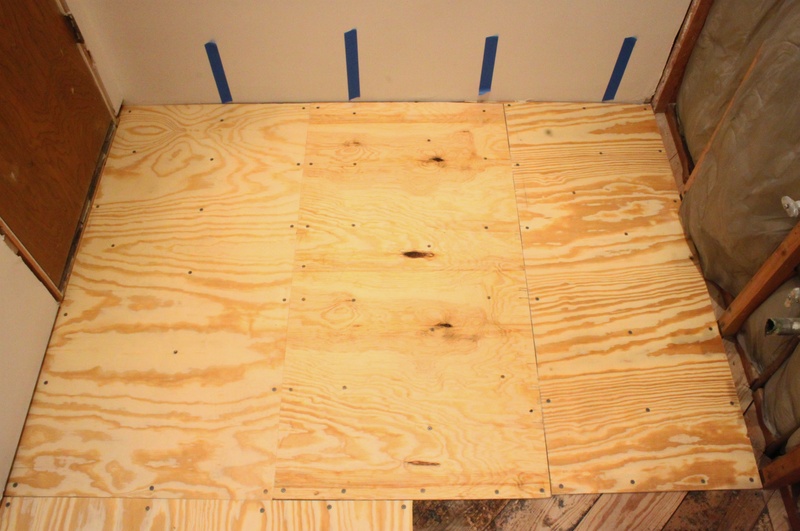 So we are laying a sub-floor and then tile. Choke on that Nicole Curtis. We’d like it to be somewhat the same…..
Screwed it down with as many screws as I possibly could. The blue tape lines on the wall tell me where the cross beams under the house are. Wanna make sure all my boards are screwed into that. Then a layer of cement board. 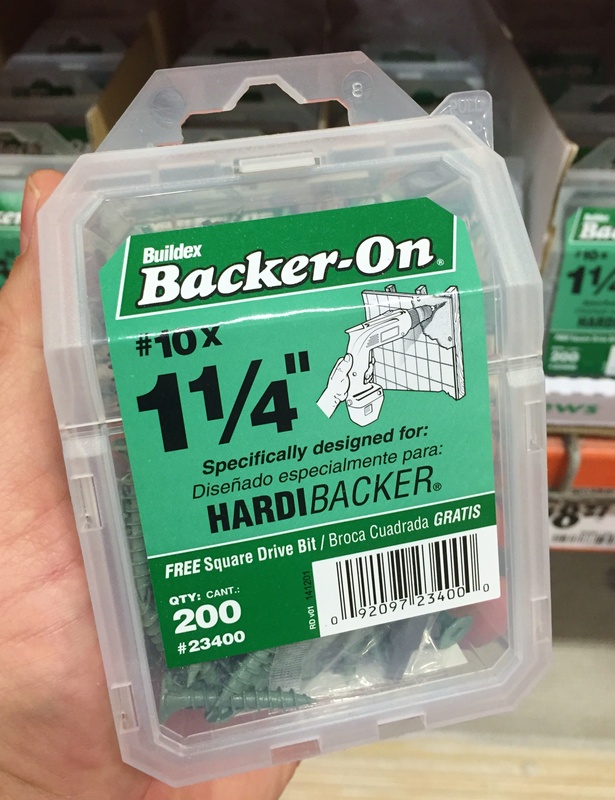 1/2″ Hardi Backer Board. Pretty standard in a house these days……Not so much in 1972. Looking pretty good. Screwed this down too. With screws for Hardi Board. 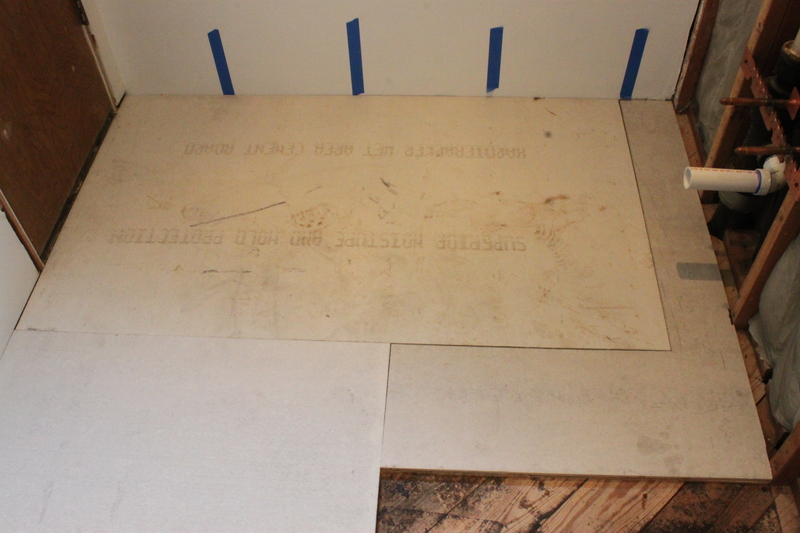 Once we add the 1/2″ thick tile we should be up to the same floor height as the bedroom…..
Oh well, mistake number one…at least it’s a small one. Let’s call it a 1/4 inch mistake. Look into Sumple Mat. It is a tile setting mat. I have used it on floors and back splashs. Easy and will keep your height down. HA HA @ the Nicole Curtis reference. Love your blog by the way. I found you from the Cottage of the Month. You had me at the color red and you cinched it at red plaid. I’ve read all of your entries now and I love you guys even more. Love your writing style and your sense of humor. So I really feel that if I were standing in your bathroom, I would feel at ease at saying, “you know if you try to make do you are going to regret it so it is best if you just start removing those screws” Can’t wait to see how you remedy it. James & Jamie – I want to apologize for the above comment. It sounds presumptive and bossy and well, just plain snarky. It was not my intent. You two obviously are capable of figuring this out and you have wonderful go to people to help you in a bind, like this situation. I truly do love your blog. My first impressions of your home tour were wonderful. Finally someone who has lots of stuff in their house, and isn’t afraid of color. I connected with your home because mine is filled with all my sentimental, pretty things, with lots and lots of color too. And after reading all your posts, that connection I felt with your home, I feel the same with you two also. It was like getting lost in a good book that you just didn’t want to put down. 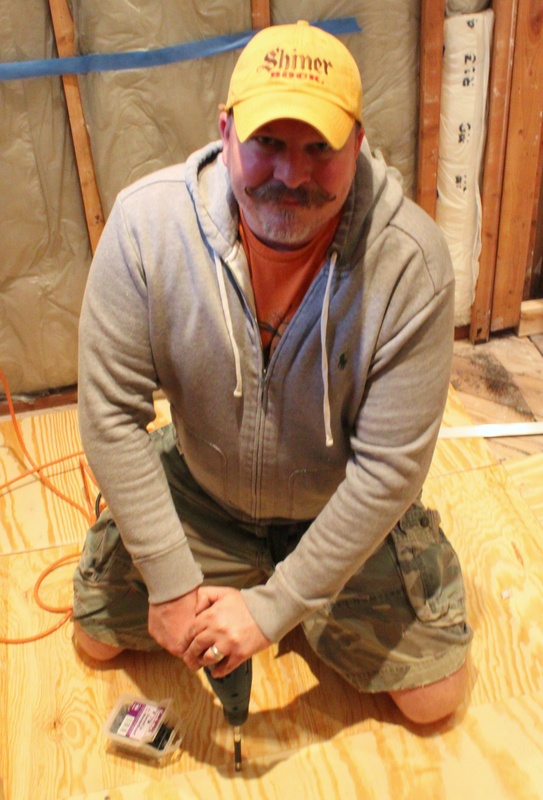 My above comment about your floor predicament was coming from my experience with old homes (mine is 68 yrs old) and how I would handle it because I wouldn’t be happy with any solution that I came up with that wasn’t quite right. My comment was suppose to be a suggestion and after re-reading it just now, it didn’t come across that way. I forgot that we really don’t know each other. Anyway, I just wanted to clear that up. I don’t usually go around insulting people that I don’t know, not intentionally anyway. I promise if I ever comment again, I will re-read it to make sure it is coming across as it is intended to be. Again, I’m sorry for the way I wrote my comment. If you are capable of deleting it at your end, please do. With that being said, I can’t wait to see what solution you two come up with for your floor. Patty, you are so silly. My skin is wayyyy thicker than that. We welcome the suggestions. That’s exactly why we put our lives out there on the internet. There is absolutely no way that we thought you were being snarky….just honest. And honestly is something that we require from our friends. No worries, I think we may have a couple solutions for the floor. Can’t go back at this point anyway, we are several steps ahead of this now. BTW. I’m the one who worries about offending people. I have a dark sense of humor, and one little Auschwitz joke…and we loose a few dozen followers. Don’t miss ’em, they obviously don’t “get me”. I know there are people like you, checking in on our lives, and relating to it in some small way. Scars and all. Loved the “choke on that” remark! I love Rehab Addict, and she lives in my town, but dang – sometimes when I’m watching it I just yell at the screen. I understand historical restoration but if it’s gonna look like crap, why not do something else? Like for instance, whatever YOU are doing for your floor! Because I know it’s going to look amazing. Hey, don’t dis Nicole, who is saving a lot of neat old houses from being torn down. 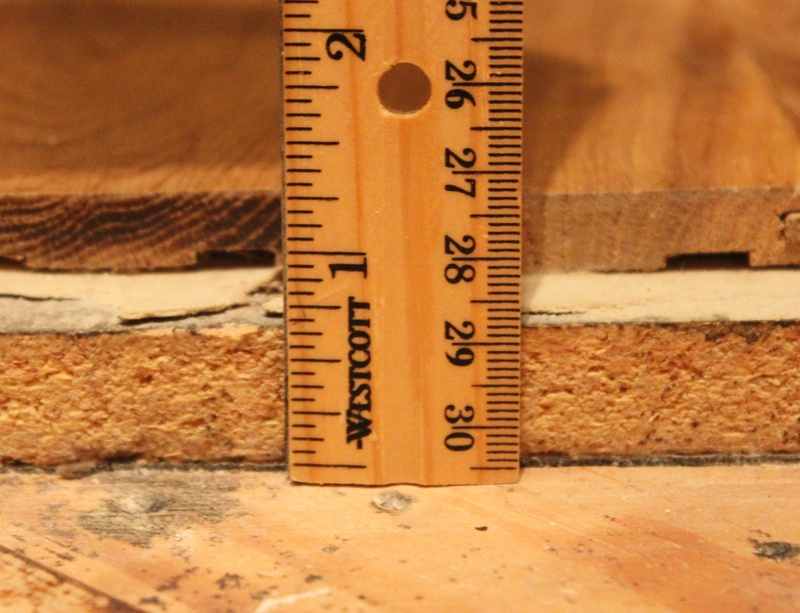 Not to mention, she wouldn’t leave a floor 2 inches lower than the rest of the house. If she were going to use that floor she would replace the board with the hole in it & most likely the whole patchy corner. She would not just stain it. It would be sanded, stained, & polyurethane added (several coats with buffing in between). Of course if your house had been in the condition of the houses she works on, she would have passed since there’s no special workmanship & style in a 40 year old tract home. That said, I like what you’ve done with your 40 year old tract home. ( I live in one too.) I enjoy your blog. Just don’t be raining on other peoples parades just because it’s not your thing. Hi Chris, don’t worry about Nicole. She knows that my tiny little teases are from a place of love……and possibly jealousy. I bought a chalk plumb to mark the beams and totally forgot to use it. Well I just love your mo!!!!!!! !